MacADAMS – Evelyn T., 93, of Hunt’s Point, Queens County, passed away peacefully in North Queens Nursing Home, Caledonia on Thursday, January 27th, 2011. Born in Sandy Bay, Queens County she was a daughter of the late H. “Mack” and Frances (Shultz) Leslie. Evelyn was a former teacher in Shelburne County and also served as a postmistress in Port l’Herbert. She was a clerk for the former Metropolitan Store in Liverpool for a number of years. 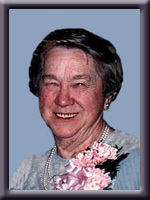 She was a member of Wesley United Church in Hunt’s Point as well as the U.C.W. She was a member of Queens Chapter #34, Order of Eastern Star, Crescent Chapter #70, Order of Eastern Star, Lockeport and the Sable River Women’s Institute. She is survived by her husband Glenn; her son Linwood (Barbara) Wolfe, of Wasaga Beach, ON. Grandchildren Richard Wolfe and Karen Wolfe and great grandchildren Tiffany, Evan, Grace and Hannah. She was predeceased by her first husband Melbourne Wolfe and her brothers Harley and Eugene. Glenn, we were saddened to read of Evelyn’s passing. Our most sincere condolances to all. We are so sorry to hear of your loss.Evelyn was a great person and we know she will be truly missed by everyone who knew her.Our thoughts are with you all. Glenn, so sorry for your loss. Our prayers are with you at this difficult time. Glenn and family, we are sorry to hear about your loss. Our thoughts and prayers are with you at this time. We are so sorry to hear of Evelyn’s passing. Our thoughts are with you. Glenn and family, we are so sorry to hear of Evelyn’s passing. Our thoughts and prayers are with you at this difficult time. Sorry to hear of Evelyn’s passing. She is at peace now Glen. Glenn & Family our thoughts are with you at this sad and difficult time. Glen And Family sorry to hear of Evelyn`s passing may she rest in peace. I`m so sorry to hear of Evelyn`s passing. My thoughts are with you at this most difficult time. Thinking of you and your family and this sad time. Hi Glen, Lin and Barb: We were all so saddened to hear the news of Auntie Ev. We have so many wonderful memories of our visits to you in Port L’hebert and then over the years to celebrate weddings, births and ultimately lifes journey. She is/was special indeed….she introduced me to lobster Hunts Point, blueberry grunt and tongues& cheeks….I still “pass” on the cod. family because we wanted to. Our thoughts are with you all, Glen . Sorry to hear of Evelyn’s passing but she is now at peace. Our Sincere Sympathy to you all. Ray and I would like to offer our condolence in the passing of Auntie Ev. She was a special lady. We have many fond memories of the times we spent with her and the family over the years. Although we have not seen her in awhile, she will always in our hearts. She will be greatly missed. Glen,sorry to hear of evelyn,she is in a better place.Our prayers are with you. I’m truly sorry to hear about the loss of your lovely wife, Glen, She was an amazing women who always brightened up the church every sunday with her presence, who could sing Christmas Carols like nobody’s business and made everyone smile and happy everytime they were around here. I know that God must have some purpose for her in heaven or else he wouldn’t have taken her yet. She’s probably up there right now trying to keep things under control. Just know that she’s at peace and that you’ve got great church memebers who are also friends around to help you get through this tough time. We’re so saddened to hear of the loss of Auntie Ev. She was such a nice lady and I’ll always have fond memories of the get togethers for tea in at Gram and Grampa Dyson’s. I wish you all the happiest memories at this time and forever forward. Grace and Ron, they will always be there for you. The Maritime Conference extend deepest sympathy on the loss of your loved one Evelyn. May you always keep keep the memories of Evelyn in your heart and treasure them each day. May the love of God surround you to comfort,strengthen and give courage to face the difficult days ahead. May you feel the love and caring of your U C W Family and know that they are there to give you support, encourage and strengthen you. We are saddenned to hear of the passing of Evelyn. She would always be pleasant,, had a warm smile and would make everyone welcome who visited her home. Hunts Point has lost yet another community member, and she always was in full support of her church, community, neighbors and family. Our deepest sympathy and condolences to you. sincere sympathy to glenn, linwood & all the families from florence fisher (tupper), 650 old greenfield road,greenfield,n.s. b6l 3y7 I’m bertha tupper’s(wolfe’s) granddaughter.bertha tupper was an aunt to mel wolfe. We extend our sympathy on the loss of Mom. I have many fond memories of the days in Port Hebert when we were growing up. Glenn, sorry to hear about Evelyn. She was a wonderful lady, always a smile, a wave or a conversation. Mom and Dad use to enjoy both you and Evelyn”s company. Our condolences to you and the family.